Being able to see and speak to someone as soon as they reach your front door is a step up from the simple wireless doorbells without imaging abilities. Wireless doorbells offer a great improvement in wireless home security, but they can only provide so much. Without video, the security enhancement supposedly being received is significantly reduced. The best video doorbell will provide all of the same properties along with live video of your visitors. By reducing the need to approach your door, the best video doorbell, or best doorbell camera, makes your home and your interaction with the outside from within it safer. By analyzing the distinctions between doorbell models such as power source, field of view, HD video, motion sensors, etc. we’ve created a list of video doorbell reviews. Each home’s and its occupants’ needs vary so continue reading to find out which model best suits you! The Ring video doorbell is one of the first WiFi-enabled devices featuring a rechargeable battery and the ability to see, hear and speak to your visitors from anywhere. Despite all of those features, it still carries many more. The Ring is a highly capable device that gives you complete control over communication with visitors through your mobile device even when you’re away from home. It also stores footage in the cloud for your subsequent viewing when you don’t have the time. The Ring video doorbell offers a number of convenient features that make it convenient enough for any building where you need additional security. The high-tech unit streams video in 720p with a 180-degree globular camera lens to provide a wide-angle view of the scene. The streaming video feed is sent directly to your smart phone or other mobile device via WiFi connection. Motion-triggered alerts are sent through the Ring app that is compatible with Android and iOS devices. In the app, you receive a preview of your visitor, at which time you can accept or decline the call. Also in the Ring app, you can check your door through one-way video or contact the visitor through two-way voice communication. The app also allows you to access multiple doorbells on the same mobile device. Cloud recording ensures you never miss the actions of visitors as footage is immediately recorded and stored for your viewing. When a visitor presses the push button, a blue light activates around the button to signal visitation. The kit includes everything you need to set it up, and there are no extra tools or professional assistance needed. Installation is easy as the unit comes with instruction videos providing step-by-step details of mounting and setup. The unit can be installed on many different surfaces including cement, wood and stucco. It features a rechargeable battery that allows you to mount the unit where you please or connect it to your doorbell wiring system. The Ring video doorbell is available in four faceplate finishes to match your exterior including Antique Brass, Polished Brass, Venetian Bronze and Satin Nickel. The Ring video doorbell has seemingly endless features that make it one of the top contenders on the market with overwhelmingly positive video doorbell reviews. It’s a highly functional and elegant device providing a range of capabilities in a modern design. Its cloud storage, wide-angle camera, HD video streaming, two-way communication and user control through the app make it a highly-sought after device for those who prefer the best in high-tech security. SkyBell is a quality brand patented in the United States and internationally. Their company is known for producing technological products and services for the convenience of the modern homeowner. The brand’s video doorbell is a WiFi-enabled device that allows you to see who comes to your door no matter if you’re at home or away. You can check visitors from your mobile device to stay connected and feel safer about answering your door how and when you want. Through the device’s app, you can use its on-demand feature to check the video feed whenever someone arrives. The SkyBell video doorbell also features a motion-triggered sensor that sends an alert even when the visitor does not ring the bell. Other features include night vision, a wide-angle lens and a weatherproof exterior. The video doorbell from SkyBell is made in the USA and features a number of incredible functions that give you more control over your home security. As one of the best video doorbells available, it’s meant to replace your standard doorbell and attaches to your wiring for full-time power. It also connects to your own WiFi network with long range capability. You can see who visits you from nearly anywhere with your iOS or Android device with the unit’s app. When a visitor arrives and presses the push button, the SkyBell sends live video feed through an alert to your phone. Even if the guest doesn’t ring the bell, the device has an advanced motion sensor to send you an alert regardless. The SkyBell video doorbell has an on-demand feature that allows you to check the view from your camera any time you wish wherever you have cellular or Internet connectivity. Multiple users can access the feed, and you can see, hear and speak to your visitor through the SkyBell’s app. You can also use the app to turn off the sound of the doorbell chime when you’re not home. The unit features a wide-angle camera, contrast setting for enhanced lighting, silent mode, night vision for better viewing in the dark and a plastic weatherproof exterior to improve WiFi performance. The SkyBell video doorbell offers a number of impressive features to enhance your home security. Even still, it does have its shortcomings as noted in video doorbell reviews, such as poor image quality, inability to record calls and events and low memory. Aside from its flaws, it still provides motion detection, night vision and on-demand access that many other models come without. The August brand is known for being innovators in home technology, and their August Smart Lock is one of the most celebrated devices in home security. With their doorbell camera, you can have the peace of mind of knowing who’s visiting even when you aren’t there to greet them. Whether you’re upstairs, running errands or away on vacation, you’ll be notified every time your doorbell is rung. When the device detects movement from guests, you will also receive alerts to help you identify your visitors. You can interact with guests visually and audibly from anywhere through your smart phone with HD video while remaining private. This is the best video doorbell to use with other wireless security devices. The doorbell camera can be combined with the August Smart Lock to give you remote control over allowing visitors to enter your home. With the August Doorbell Cam, you’ll always know who comes to your front door even when you’re away from home. The device allows you to speak with with visitors using your mobile device with the two-way audio feature. Whenever a guest rings your doorbell, you receive alerts to your smart phone wherever you are. The HD video provides a great view of visitors while still allowing you to maintain privacy. If you miss a guest or simply want to replay a conversation, the video doorbell has a recording feature that captures every interaction. You do need a reliable WiFi signal to use the device properly. For a typical home, a router distanced 10 to 15 feet from the door will provide adequate signal strength. If you already have a weak WiFi signal, or your router can’t be moved within close distance, you may need a WiFi extender or booster to get the full experience of the August video doorbell. One of the most unique and helpful features of this device is the fact that it can be used in conjunction with the August Smart Lock. When used together, you can control your lock from anywhere via your smart phone. You will also be able to view the status of your lock to know when it’s engaged or left unlocked. In addition, you can receive instant alerts on your phone when someone enters or exits your home. The unit replaces your existing doorbell, so it must be hard wired. Buyers in video doorbell reviews agree that this is one of the most impressive video doorbell models available simply due to its use with the innovative Smart Lock. Being able to use the two together provides the ultimate control in remote home security. There are several models of video doorbells available by 1byone, and the 7-inch touchscreen is the best video doorbell in terms of having the total package. It has a classy appearance that blends well with any exterior along with an advanced touchscreen monitor for easy use. It offers a 120-degree view along with night vision to give you the utmost in visual security. There are 14 polyphonic melodies you can select as visitors engage the doorbell, and you can adjust the brightness and volume of the unit for the comfort of your visitors. Its more unique features include the ability to browse and delete photos along with remote unlocking of your door. The 1byone video doorbell comes with a multitude of features, and some of them are quite unique compared to other models. It offers a 120-degree field of view with 13 inches of viewing distance and a time and date display. It has the ability to automatically take and save photos that can be kept on your own SD card, and it allows for video recording and playback. The ring volume, talking volume and brightness can all be adjusted as well. The video doorbell from 1byone offers night vision to capture images even in low light, and its advanced infrared ability helps create a clearer picture. Its two-way intercom allows you to see and speak to visitors as they arrive, and you can monitor the footage safely inside without coming near the door. Should you decide to let your guest in, the device is equipped with an electronic door release that allows you to unlock the door with the press of a button. You must purchase the accompanying electronic lock to enjoy this feature, however. The outdoor alloy camera features a rain shield to protect it from damage caused by harsh weather, and it is built to be durable enough to resist oxidation. The unit comes with a 15-meter cable that allows you to place the monitor on the wall, on your desk or anywhere else within reach. Though adjustable, the volume may be too quiet for some users. This video doorbell is easy to install as it only requires working with two wires. It performs well no matter where you are in the home, and it offers a clear display to help you properly identify those at your door. It’s reasonably priced and offers a number of upgrades to enhance your security. Vtech is an internationally recognized brand in consumer electronics, and they’ve also tackled the home security market. Their IS7121-2 video doorbell helps to make your home safer by providing video capture and sound to display who arrives at your door. It’s one of the best video doorbells to offer portability as well. It comes with 2 handsets that give you the opportunity to check your visitors even when you don’t want to accept them. The handsets can also be used to communicate with visitors or used as a walkie-talkies among other members in the house. 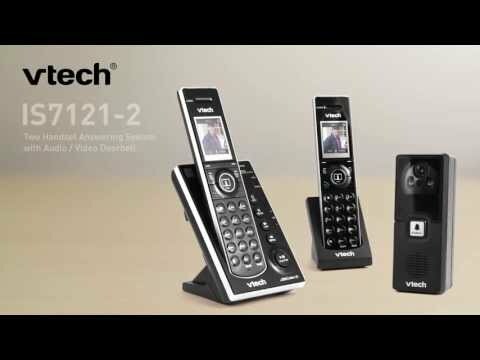 The Vtech IS7121-2 is a cordless answering system and video doorbell combining a phone with a digital camera to provide you convenience and security. It automatically takes a photo and sends it to your handsets whenever a visitor rings the doorbell. You can steam video, audio or both with the simple interface. Even if you can’t get to the door or the handset, you can receive a voice announce alert that announces the names of your visitors through speakerphones. The push-to-talk feature allows communication between the handsets, so residents can communicate with each other in times of emergency or when preparing to accept a guest. Countless video doorbell reviews list this as a selling point. The digital answering system allows up to 14 minutes of recording time to take calls when you can’t get to the door or handset. It also features an automatic night vision mode to provide better images in low light. You can adjust the contrast to optimize image quality or suit your preferences. Camera adjustment is also possible to select a variety of angles by moving the unit up, down, right and left. This adjustment is possible via a joystick inside the housing of the doorbell unit. The volume can be adjusted as well to suit your or your visitors’ desires. You can answer calls via the speakerphone or handset, and the equalizer helps improve the quality of the sound no matter how you receive it. This unit carries a very suitable price tag, and it makes a wise purchase. It offers one of the most useful features in its handset components that allows communication outside and within the home. If you want the most in convenience and security the IS7121-2 makes an excellent purchase. The performance of your video doorbell is the most important factor in your purchasing decision. Your unit should perform well from the moment you install it. Make sure to do research on any units you have in mind so you can compare and contrast their abilities to find the best video doorbell among them. The range of your video doorbell will determine how far you can separate yourself from the main unit while still being able to communicate with it. If you use the system within a smaller building, you don’t need to opt for the longest range. If you need to use it in a large house or other space, this factor will be more important. Along with the sound of the bell, visual cues are important to let both you and your visitor know the doorbell has been engaged. If you receive alerts through your mobile device, you may not need this feature. Such alerts help provide an additional signal in loud settings or for the hearing impaired. A device that is easy to install should also be a priority. You shouldn’t buy the most souped-up video doorbell you can find if it isn’t easy to install. A good model will come with detailed installation instructions and maybe even a few tools to get started. A quality product should have a decent cost, so you don’t want to end up losing features you need just to save money. On the other hand, not all expensive products are worth the cost. Check the doorbell reviews to learn the most useful features. Find a balance between the features you need and the amount you’re willing to pay. Just like an easy installation, you want to find a product that is easy to use. Video doorbells require more knowledge to use all of their functions compared to standard wireless doorbells, so be sure you understand how to handle its extra capabilities. For video doorbells, the resolution is an important factor to determine how well the unit performs. There’s no use in having a video camera if you can barely make out the image. HD cameras are best to use when you can, but anything less than HD must offer a picture clear enough to identify visitors. Just like your images and recorded videos, you’ll want the live stream of your camera to produce a quality stream. The image should be as clear as possible and the feed should transmit well without lagging. At worst, you should expect a slight delay in the feed. The best video doorbell will be versatile enough to offer a large number of ring sounds from which you may choose. This may not be that important to you, but you may find yourself tired of hearing the same sound after using it for a long period. Some bells even allow you to use common holiday themes. The sound your bell produces is one of its most important features. You need a digital wireless doorbell that can produce sound in a similar way to the real thing. The sound should be clear and loud in order to be heard in all spaces of your home. The best volume control will be an adjustable volume. This gives you more options to change your sound based on the situation. You can also change the sound to fit the preferences or comfort level of those around you. A quick scan of detailed video doorbell reviews will tell you how important this feature is. Because of the cost and advanced capabilities of a video doorbell, it needs to be kept as safe as possible. The most durable video doorbells will be able to resist weather or corrosion by being crafted from the proper materials. Because a doorbell with a video camera is a highly-technological device, you should aim for a system that looks as good as it performs. While appearance is not paramount, it’s best to choose a gadget that looks sleek and defined along with the other home tech systems you’re likely to acquire. Video doorbells are often used with many other devices including digital locks and mobile devices. Before purchasing, make sure the doorbell you pick will work with your smart phone or tablet or any other tech accessories you’d like to install. Having a video doorbell isn’t just about having any image available for the sake of bragging. You need not just video but good video with a resolution high enough to make out the face of anyone who presses the bell. Even if you don’t buy a unit with an HD camera, make sure the resolution is still adequate. Many video doorbells provide additional high-tech features such as compatibility with other wireless security accessories. If your budget allows, try to find a video doorbell that also syncs with a wireless lock to give you full control over who enters your home. You may want to check on someone at your door before they walk up, or they may not activate the door bell. You should have the ability to access your doorbell camera as you wish, so on-demand access is a significant feature to keep in mind when shopping. Like the ability to capture video, having motion sensor technology means very little if it doesn’t operate properly. A good motion sensor won’t activate with false positives when no one is actually there. A doorbell with quality motion detection will be able to discern between the movements of visitors and those of the wind or animals. You may want to come back to an event that has taken place through your video doorbell for future viewing. The best wireless video doorbell will keep a record of footage or even audio conversations you’ve had so you can pull them up as you need them. Why Would I Spend More for a Video Doorbell? A video doorbell offers enhanced security by default by allowing you to see and interact with anyone who visits your home. In addition, many models of video doorbells are available for similar or even less cost than standard wireless doorbell models. What Video Resolution do I Need? The best resolution would be HD 1080p, but you may not need this for your doorbell. Depending on the model, the environment in which it’s installed and the mobile device you use to view it, you may be fine with 360p or 480p resolution. If your video doorbell comes with recording and storage ability, it may keep this information on the cloud. This is an Internet-based system that stores and shares data to computers and mobile devices on demand. You’ll be able to access your own information from any device that has Internet access. Do I Need to Purchase Additional Security Accessories? Many video doorbells allow remote control to the unit or to other devices. The most common pairing is between the wireless doorbell and an electronic locking system. This is not a requirement to get the full benefit of the doorbell camera, but it makes your home security much more convenient. Must the Video Doorbell be Used for Home Security? You can use a video doorbell anywhere you expect to have visitors and can’t or won’t immediately be available to greet them. Though it adds to your personal security, you can simply use it as an answering system even in your business when customers arrive. Video doorbells provide even better security than the standard surveillance system. It can even prevent casing the house by burglars ones. They allow you to see visitors live as they approach your home in addition to being able to interact with them. The best video doorbells even allow you to unlock your door so guests may enter. Choosing the best WiFi doorbell requires careful consideration of the capabilities of these devices and comparing them to your intentions for use. Aim for a model that has the features you need without missing out, but don’t waste money on anything you don’t plan to use. If you want to get the best system for your safety as well as the best value for your money, you’ll make sure to analyze your decision as extensively as possible. Do your research even after you’ve narrowed down your choices. Thoroughly read and compare video doorbell reviews for your preferred models before making a final decision, and make your home safer today.